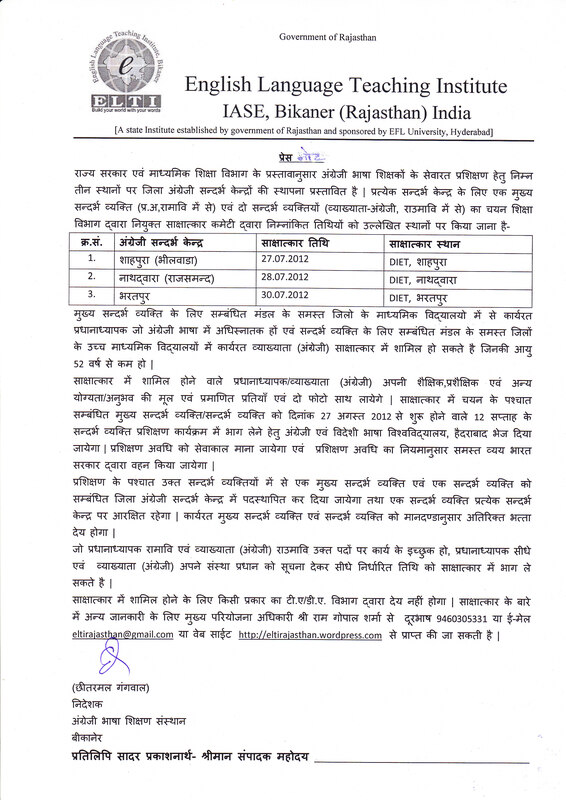 The Resource Persons for the proposed new DCEs will be selected from the HM and Lecturers who are already in service by the interview committee on 27 July 2012 at DIET, Shahpura, 28 July at Nathdwara and 30 July at Bharatpur…..
Those who are interested can present at the respective DIETs on the aforesaid dates with original documents with two recent pp photos. Selected candidates will be sent to EFL University, Hyderabad on 27 August for 12 weeks Resource Persons’ training. After completion of the training the RPs will be appointed at the respective DCEs for in-service training programmes for Senior teachers of English of that area. The Chief Resource Persons and Resource Persons will get Rs. 2000.00 and 1500.00 respectively for their work plus salary as per the norms. VOA Special English Word Book. Large English Vocabulary Word Lists (ESL/EFL).